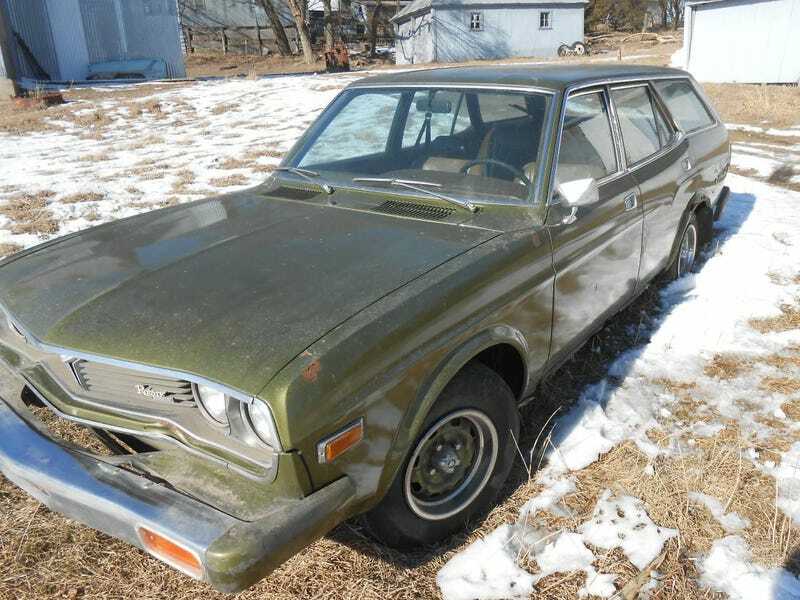 For $950, Could This 1974 Mazda RX4 Wagon Be The Barn Find Of The Century? The seller of today’s Nice Price or Crack Pipe Mazda RX4 says it has been in storage since all the way back in 1982. Let’s see if its present condition and price are enough to warrant waking up Rip Van Wankel. Peas in your carrots are okay, right? Just as is peanut butter in your chocolate is a mighty fine sweet treat, agreed? That unique advantage of being more than the sum of their parts, a merger of equals as it were, was not extended to last Friday’s weird VW Rabbit/Pontiac Fiero mix. No, not only did many of you express distain over having just been exposed to the beast—how dare I—but fully 65% of you found its price to be Crack Pipe worthy as well. From what I hear, boarder town donkey shows have a mix of similar responses. You can count the number of Wankel-producing automakers on one hand. Go ahead, give it a try. For the number of those that made rotary wagons, all you’ll need is one middle finger outstretched in bold defiance of the status quo. Yep, only Mazda built wagons with Wankels, and in fact they built two of them over time—the RX3 and RX4—and then no more. Mazda hasn’t given up on wagons—they have a lovely longroof edition of the Mazda6—although they exclude that from their U.S. line up because we like our wagons tall like our Starbucks. Back in the day however, Mazda offered up cars like this 1974 RX4 in wagon form, and not only that but also like in this car, its rotary engine could be backed up by a handy five-speed stick. The RX4 was introduced in its home market as the Luce Rotary in 1973. It made its U.S. debut the following year as the RX4 and could be had here in two-door, four-door, and wagon forms all with a 110-bhp edition of the 13B two-rotor Wankel. The RX4 would eventually be replaced by the 929 as Mazda’s naming conventions evolved, and the Wankel was edged out of the company’s lineup. This one is said to have had a very short active life as after only eight years and 88,000 miles, and for reasons unknown, it was apparently put into long term storage. What has it been doing over the ensuing years? Well, from its appearance it apparently took up rusting as a long-term hobby. There’s significant road rot down the rockers and over each rear wheel arch. The hatch looks surprisingly good, as do the chrome-plated bumpers. The rust seems to be nothing that a decent body shop (or extra handy Jalop) couldn’t tackle, but for the inexperienced it could be daunting. There’s also a weird dent above the bumper but below the grille that needs attention. The interior looks to be in better, if a bit moldier shape. The vinyl seats appear to be intact, and while there only looks to be a single crack in the dash, the whole place needs a good wipe-down with some bleach. You might want to also get one of those bug bombs that kills the black widows that like to live in nooks and crannies near stuff you need to touch. On the plus side, the car has A/C, and the steering wheel looks like a Transformer. As the car has not run since 1982 (the 49ers won the Superbowl that year, BTW), it’s not necessarily a shock to learn that it isn’t running now. It’s apex seals are probably no longer sealing their apexes, and the carb is probably filled with more syrup than an IHOP. Just suffice to say it would be a miracle to get this car home and have it driving a week later. The car comes with some parts to get you on your way, however. That’s all probably why the price is only $950. And you’ll now need to decide if this barn-find Mazda is worth even that. Keep in mind that there is more than that amount just in parts on the car, including an all-original grille, tail lights, and interior bits. Just don’t tell the seller that should you go to negotiate a deal. What’s your take on this RX4 and that $950 price, does it seem worth the hassle? Or, is this a found car that you would tell to get lost? 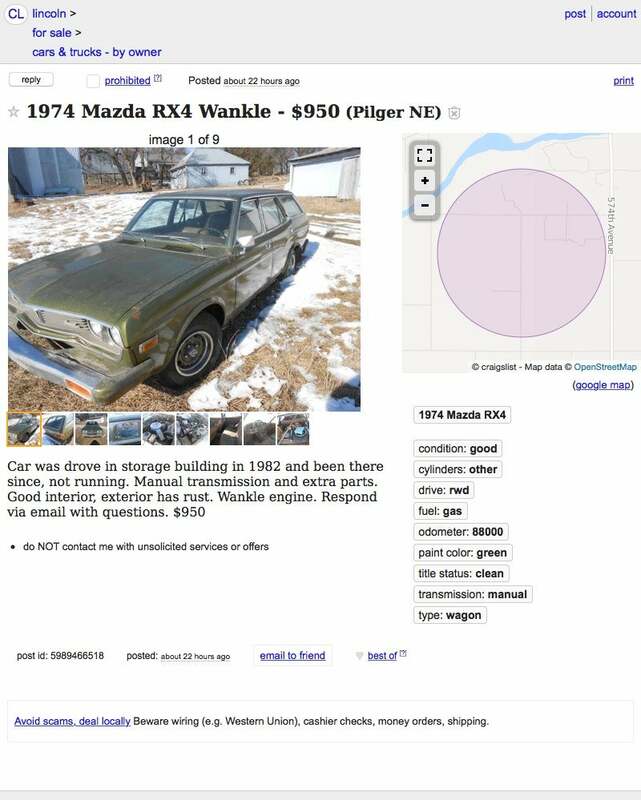 Lincoln NE Craigslist, or go here if the ad disappears. H/T to Glemon for the hookup! For $3,500, Could This Crazy 1979 VW Rabbit Cabriolet Make Everything Okay? For $2,000, Would You Give This 1987 Mazda GT Turbo A New Home?